I am working on changing the way mortgage debt accounts are handled on Undebt.it to make the calculations more accurate. The original way I had mortgage debts setup was the same as all of the other debt accounts – simple balance adjustments based off of payment amount and interest rate. However, most mortgage accounts have an escrow account associated with them for property taxes, homeowners insurance, PMI, etc. Undebt.it will now allow you to take the escrow account into consideration with an “escrow payment” field that’s only visible on mortgage accounts. The “monthly payment” field should be your actual mortgage amount (without any of the escrow fees). If you don’t use an escrow account or don’t want to separate them, just use the full amount in the monthly payment field and leave the escrow payment at zero. In the example above, when you record your payment of $1,795, your payment history will show the $1,225 amount paid to the loan, of which approx. $516 of that will go to interest and the rest goes to the mortgage principal. Hope this helps clarify things a little….these changes will go into effect later tonight or tomorrow. Thanks for your feedback and support; keep it coming. This website is amazing. So much functionality for free is unreal. This really helps my wife and I see progress and potential progress. When I put my information in for my mortgage, it changes the payment amount on the payoff table. Somehow it’s increasing my principal. There is no place for me to edit my principal, only escrow, int rate, and total payment. Can you let me know why it’s automatically changing my payment? The principal should be in the “monthly payment” field. The total of everything else should be in the “escrow, taxes..” field. Hello. I appreciate your software. I have entered the principle in the Mortgage Payment field and the escrow amount in that field. The taxes were correctly calculated by the software. 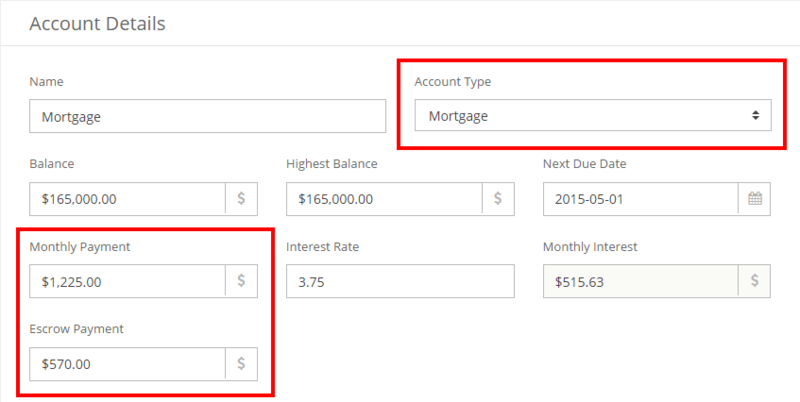 In the account list view the monthly mortgage is inaccurate. It is several hundred dollars less than it should be. When I entered the full monthly payment excluding escrow the payment was reflected at a value higher than the actual payment. How can I correct this? I have a similar issue (love the program!!) – my mortgage all told is 1,152.79 – principal 230.68, interest 423.76, escrow 498.35. The interest when calculated comes out to be about .09% less than the actual amount. The Master Account list comes out 74.75 higher than I owe monthly (1,227.54	), and on the Debt Snowball Table it shows my monthly payment as 729.03 which is a bit less than the 1,152.79 that I do have to pay monthly. Please accept this as feedback and not criticism, I’ve found this tool very helpful and I look forward to using this in the coming years!! Thanks! This website is awesome. We have paid off over $70k in less than 3 yrs.. We are trying to kill the mortgage now.. But the escrow field doesn’t show up when I chose mortgage. How do I fix this? You should see a field called “Escrow, Taxes & Insurance” when the mortgage account type is selected. For those that may run into this issue in the future. When you create a new account, the pop-up window doesn’t have the logic to add the escrow field. To work around this, just create the account as a normal credit account and then go in after it is created and change it to a mortgage – then the escrow box will show up. I set up my mortgage with no snowball amount or extra payments, but the payoff schedule does not match the amortization schedule on my mortgage site. (Undebt.it says I’ll finish paying it off 6 months later than my mortgage company thinks I will). my next payment is not due til Dec 1, but the payoff plan here says that my balance will increase in Oct and Nov. It also seems to think I’ll be putting the next 2 month’s payments as snowball payments, so shouldn’t that take my balance DOWN not UP? Something seems wrong in that beginning logic. Is there anything I can do to work around this? If you’re not paying on a loan for two months, the balance will be going up due to accrued interest every month. I am seeing similar issues with the “Payment” not being calculated correctly after putting in my Principal for “Monthly Payment” and Escrow info. Interest does appear to be calculated correctly. Then I noticed something about the numbers. As far as I can tell, instead of the Payment being Principle + Interest + Escrow it appears to be doing Principal + Escrow + Escrow. After I noticed this I tested by adding $1 to my Escrow and, sure enough, the Payment went up $2. I hope this helps in troubleshooting this issue.